Lethal Injection is a brawling action game played from an over-the-shoulder perspective. The player uses melee attacks to beat a path through the enemy forces and advance in each level. It was developed with the Unreal Development Kit. I was the game designer and a level designer on this game. My involvement with Lethal Injection began partway into its development, when the lead programmer was recruiting more members. As a game designer and level designer, my responsibility was to create engaging gameplay while mostly remaining within the parameters of the original creative vision and planned features. I became the only dedicated designer on the team, synthesizing input from the other team members and turning that into more concrete game direction. I also pushed for having a deeper combat system, with a variety of different attacks for both player and enemies, but that was adding more work than the team was comfortable with. This combat system design document describes my proposed revision. Although we did not use this design, I enjoyed thinking about how to create a richer melee experience for a first-person-shooter control system. The challenge of matching character abilities to particular input systems is interesting to me. The actual combat system in the game features 2 attacks for the player, 1 for most enemies, and 2 to 4 attacks for the bosses. I designed the player to have a fast primary attack with strong knockback to beat back swarming enemies. I designed the secondary attack to have a long recovery animation that leaves the player vulnerable, but the attack can be charged up to inflict greater damage than the primary attack. However, charging the attack also leaves the player vulnerable by slowing player movement. With two attacks, the player is able to choose the better tool for the situation. Bosses have different attack phases, during which one of the player's attacks may be more advantageous than the other, and the player can observe the situation and figure out a strategy. Both attacks have knockback ability, resisted by enemy mass, and smacking a dead foe away gives players a satisfying feeling of power. The player's attack damage and enemy health are set to clearly indicate that the charged secondary deals more damage than the primary attack. The weakest enemy can die in 2 primary attacks or 1 charged attack. A medium enemy can die in 3 primary attacks or 1 charged attack plus a primary attack. A strong enemy can die in 4 primary attacks or 2 charged attacks. In all cases, the number of required attacks is low enough for a player to reasonably keep track of and perceive the differences. This clearly shows differences in the different attacks and enemies and allows players to evaluate what attacks to use in each situation. Most enemies in the game have a single attack, and most of the enemies have a very similar melee attack. The simplicity of the enemy attacks means it would be uninteresting to fight one for a long time. For this reason, I spawn most enemies in large groups in which individuals have little health. 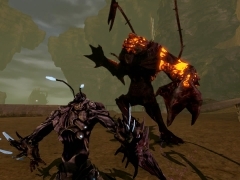 Allowing the player to quickly kill individuals gives players a sense of accomplishment, and prevents having to deal with an unchanging enemy for long. Spawning enemies in groups challenges the player, since having enemies with low health would otherwise be too easy. 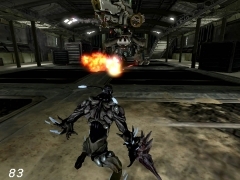 The enemy groups threaten to surround the player, which forces the player to stay mobile and use knockback attacks to escape. The enemy swarming behavior creates situations in which the player must decide whether the primary or secondary attack is better at the time. While surrounded or near the enemy, the secondary attack leaves the player too vulnerable. However, given some distance and time to charge the secondary attack, its damage can be more efficient in thinning the swarm. A single enemy attack can destroy a large portion of the player's health, making it lethal to get surrounded. However, the player also heals a very large amount from killing an enemy, making it possible to heal from hit-and-run tactics against the weakest enemies in the group. The risk in the player dying quickly, combined with the ability to also heal quickly keeps the player excitingly close to death, yet in control. There are no healing items to scavenge and slow the pace of action. The player does not heal from waiting around, but must fight and remain active to recover health. The system of recovering resource through fighting creates faster-paced action, and continuously rewards the player for combat success. I spawn weak enemies near bosses so players can kill them to heal during the long boss fights. This gives players reason to switch targets as needed for the moment, making fights more dynamic than if players were to continually strike the same target. Bosses have large amounts of health to make the encounters more intimidating and challenging. They also have a larger variety of attacks so that the long fight does not feel as repetitive. Bosses will change their attacks in response to taking more damage, forcing the player to also change tactics in response, and creating a greater sense of interplay. Fights feel more alive when combatants respond to each other's actions. The changing boss attacks also serve as a measure of progress for the player, showing that the boss is being gradually worn down. While most enemies in the game have melee attacks, bosses have distinctive ranged attacks to make them stand out. All ranged projectiles in the game move slow enough for the player to enjoy dodging gameplay. Unlike in games with "realistic" firearms, players have the opportunity to respond defensively to incoming attacks. Having to deal with undodgeable instant-hit projectiles while approaching enemies would have made the melee-based player feel helpless. Dodgeable attacks promote engaging interactivity, allowing for players to decide between aggressive and defensive movements. There are multiple approaches to defeating bosses. The first boss battle is a 3-way fight between the player and 2 other opposing factions, so the player can make use of one faction to help destroy the other or just try to kill everyone at once. The second boss battle can be won by making use of the environment rather than fighting directly, rewarding players for cleverness and observation. Thorough exploration reveals collectible pickups that will power up the player to fight the second boss, rewarding diligent explorers. I enjoy presenting players with goals that allow some flexibility and creativity in choosing how to accomplish them.